Punjabi Kadhi Rice is a yogurt-based curry served with rice. 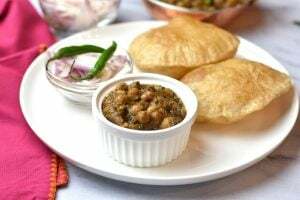 It is all-time favorite comfort food in many Indian homes. 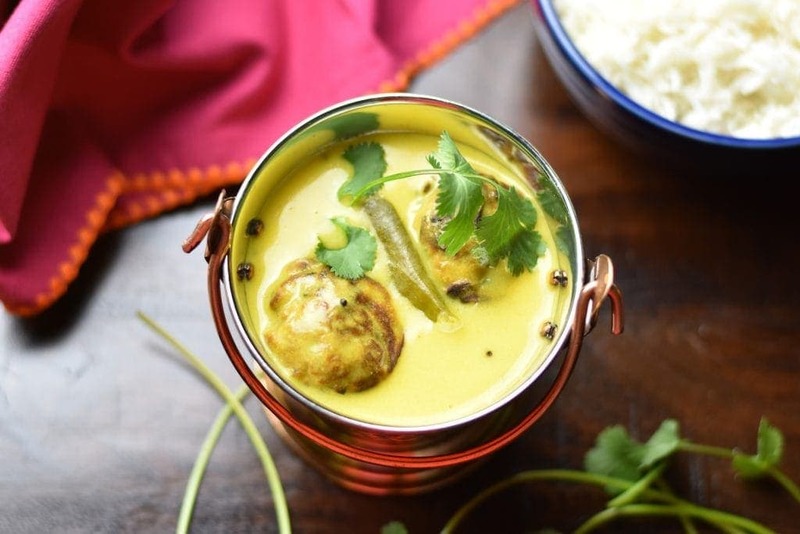 It’s a traditional dish from the northern region of India, in which a yogurt and chickpea-flour based curry, called Kadhi, with chickpeas-flour fritters, called Pakoras, is served over aromatic basmati rice. 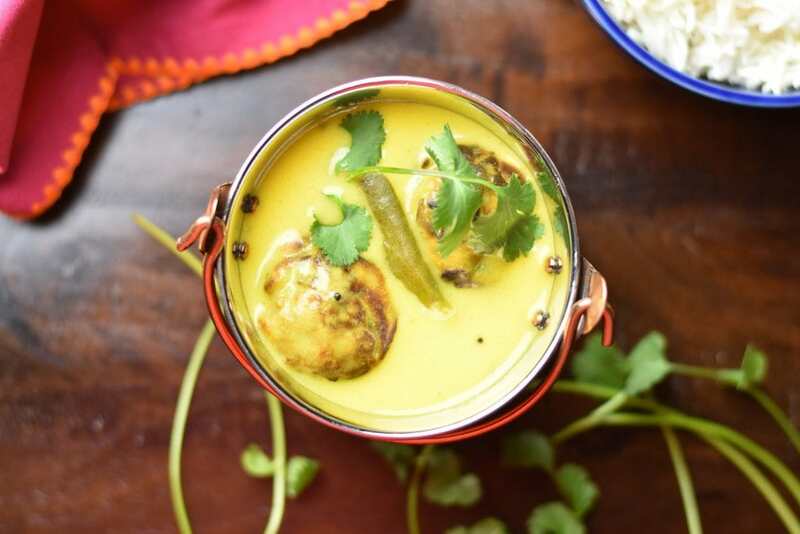 There are several variations of this dish, but this style of serving Kadhi (curry) with Pakora (fritters) is commonly known as ‘Punjabi Kadhi‘. This kadhi recipe is close to my heart, as it’s been passed on through many generations in my family. Even though the recipe for Kadhi is fairly generic, everyone has their own spin on it. My grandmother always cooked the kadhi and pakoras in mustard oil. My mom substitutes mustard oil with ghee, and also adds chopped onions to her pakoras, and sliced onions in the kadhi. I customized it further and started adding chopped spinach to my pakoras in addition to the shallots/onions. I also started pan-frying the pakoras versus deep-frying them. This is my quick and healthy twist on this family favorite. Here’s the detailed recipe for No-Fry Pakoras (Fritters). Follow step 1 as outlined below and make Kadhi in a sauce pot on medium heat. Simmer for 10 minutes on medium low flame. Following step 2, make rice in a another sauce-pan on the stove-top, or, in the microwave. The ratio of rice-to-water is different than when cooking in a pressure cooker. Add 2 cups water to 1 cup of rice for both, stove-top, or microwave method. Follow step 4 and make the pan-fried pakoras and keep aside. You can deep fry these pakoras too. 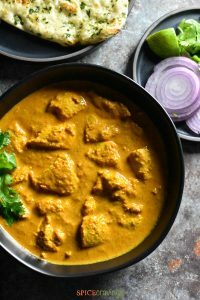 Bring everything together by simmering the pakoras in the kadhi for 2-3 minutes, so that they get soft and absorb some kadhi. Garnish with roasted cumin and cilantro, and serve warm over rice. 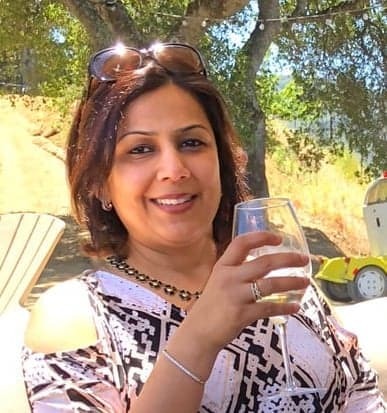 In this recipe, I made rice and kadhi in the same instant pot, using pot-in-pot technique. As shown in the video, I cook the kadhi in the main pot and rice in a smaller pot placed on a trivet, all in the same inner pot. It’s not only a huge timer saver, but a super convenient way to make this a one-pot meal. Watch the video to see how easy it is to make Punjabi Kadhi Chawal (Yogurt Curry with Rice) using the PIP method. 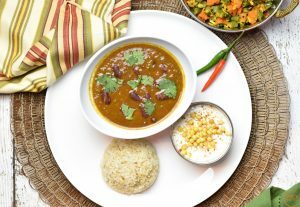 If you like this, try some more Punjabi favorites like Rajma Masala, Butter Chicken, Chole Bhature, Paneer Tikka Masala ! 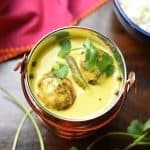 Punjabi Kadhi with rice is a delicious yogurt and chickpeas-flour based curry, called Kadhi, with chickpeas-flour fritters, called Pakoras, served over aromatic basmati rice! This is a one-pot Instant pot recipe for a classic Indian comfort food. Make Kadhi: Add sifted chickpeas flour (besan) to the buttermilk or yogurt. Add salt, turmeric, cayenne and water. Using a hand blender or a wire whisk, mix everything well to form a smooth, lump-free batter. Melt ghee on SAUTE mode in Instant Pot. Add mustard and fenugreek seeds. Once the seeds begin to splutter (in a few seconds), add curry leaves (optional), and sliced shallots (or onions) and saute for one minute. Adding shallots is optional; they provide a nice sweet texture to the kadhi. Add the buttermilk/yogurt mix and stir well. Add green chillies. Making rice in the same pot: If making rice in the same pot, place the trivet in the instant pot. In a smaller bowl, combine rinsed rice, salt, water and oil. Place the bowl on the trivet. Pressure Cook: Close lid. Cancel SAUTE. Set vent to sealing position. Pressure cook for 6 minutes on Manual/Pressure Cook (high). Make No-Fry Pakoras/Fritters: This step can be skipped if you like your kadhi plain. In a large mixing bowl, combine chickpeas flour (besan) with spices and baking soda. Add water and make a pancake consistency batter. Add chopped spinach and sliced shallots. Mix well. Heat a stuffed pancake pan on medium heat. Add about 1/2 a teaspoon of light olive oil, in each cavity. Using two spoons, add about a tablespoon of batter in each cavity. Cover the lid and cook for 2-3 minutes on the first side. Add a few more drops of oil on the pakoras and flip them. Cook for another 2-3 minutes. You can instead deep fry the pakoras as well. Wait for 10 minutes before releasing the pressure manually. Open lid after pin drops and pressure has released. Remove rice and trivet. Turn on SAUTE. Add roasted cumin and stir. Add the pakoras and simmer for 2-3 minutes, till the pakoras get soft and soak some of the kadhi. Garnish with fresh cilantro and serve warm, over rice. Estimated Total time: Prep: 8-10 mins, Saute: 1-2 mins, Pressure build-up time: 10 mins +/-Pressure cook time: 6mins, NPR: 5 mins, Saute: 2-3 mins. 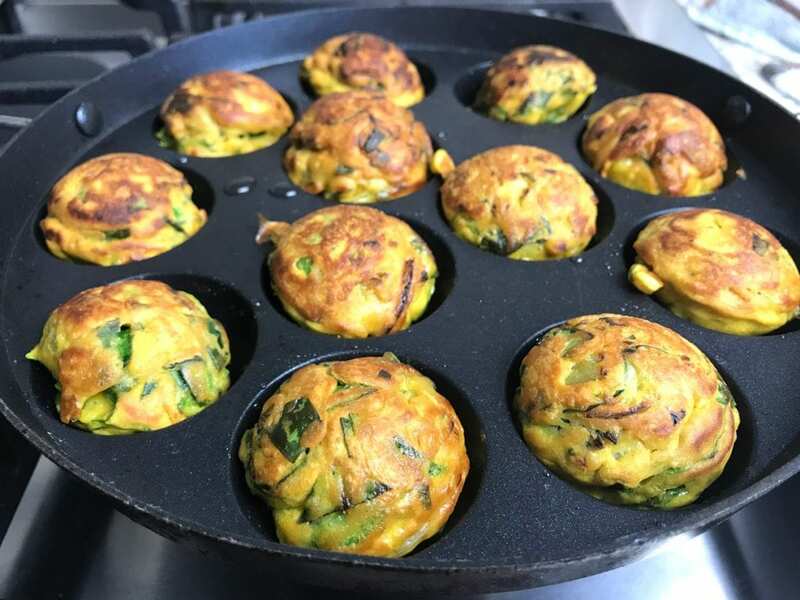 Pakora: 10-15 mins, I make Pakoras while the curry is cooking. Total time: Around 35 mins. Note: The nutrition facts below are my estimates and do not include rice. If you are following any diet plan, I recommend cross-checking with your preferred nutrition calculator.